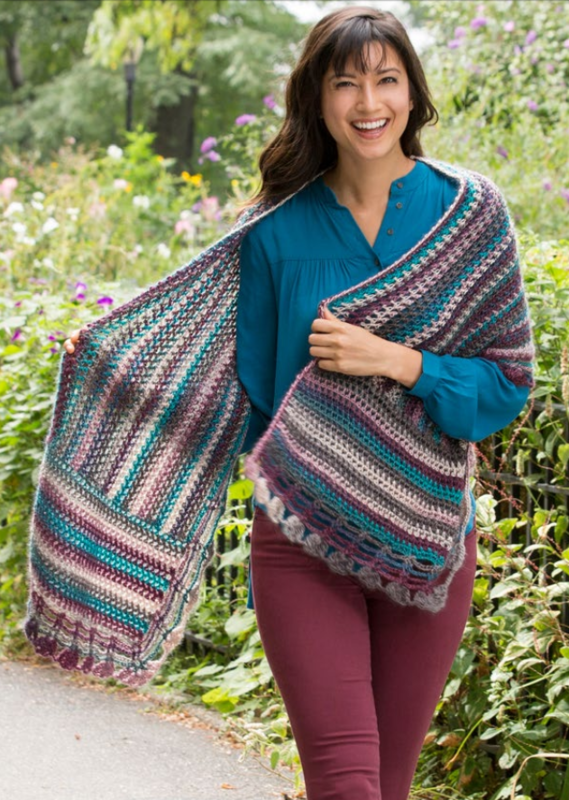 Free Pattern Friday: Crochet Wrap Pattern from Red Heart! Happy Free Pattern Friday, yarnies! 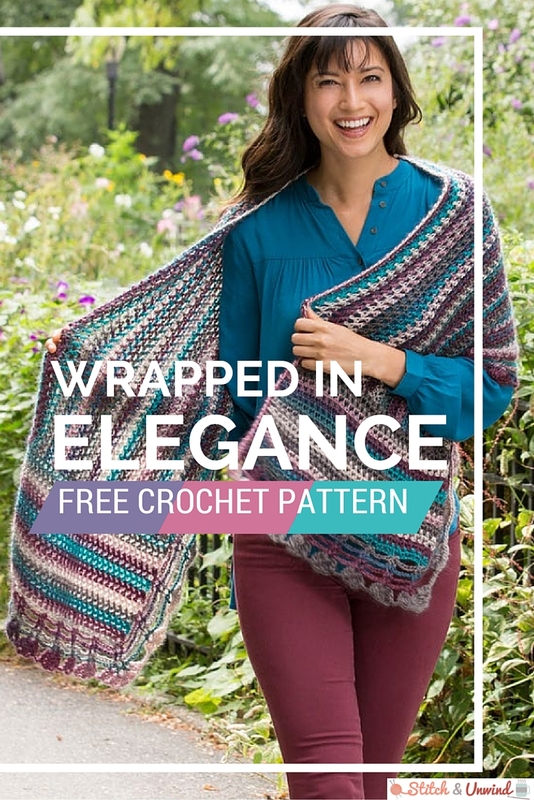 I’ve been loving the look of crochet wraps at the moment. It’s basically an excuse to wear a blanket in public, and it’s a total fashion statement on top of that! There’s no better way to dress up a plain t-shirt or sweater than by throwing on a cozy wrap. 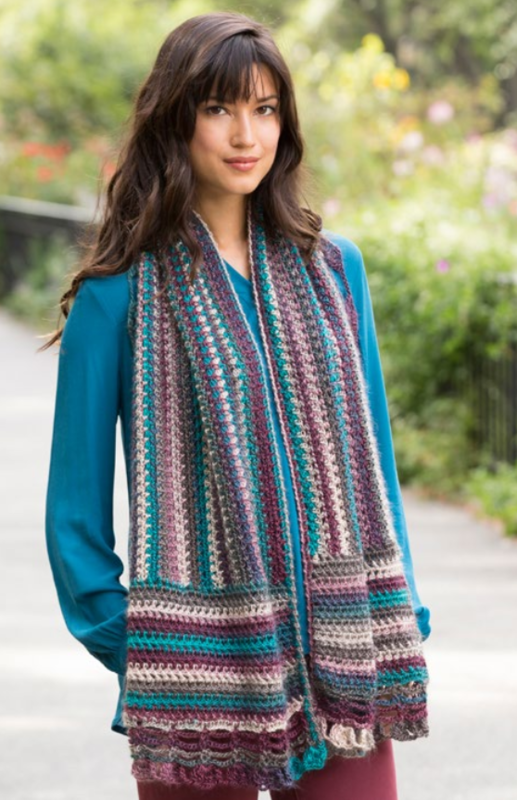 This free crochet pattern from Red Heart is totally decorative and delightful and the yarn does all of the striping work for you. Enjoy working up this wonderful wrap, and I’ll be back with another pattern for you next week! 2 pattern repeats = 4” (10 cm) (one pattern repeat consists of one herringbone half double crochet and one chain); 14 rows = 4” (10 cm). CHECK YOUR GAUGE. Use any size hook to obtain the gauge. Shawl measures 17” wide x 60” long (43 x 152.5 cm). Center panel of wrap is worked in turned rows. Side panels are worked across each end of center panel. Four rows of edging are worked across side and bottom edges of each side panel and across bottom of center panel. Edging finishes in a round around entire piece and with a row of reverse single crochet across the top edge. beg 3-tr Cl (beginning 3 treble crochet cluster) = Ch 3, [yarn over] twice, insert hook in indicated space, yarn over and pull up a loop, [yarn over and draw through 2 loops on hook] twice; *[yarn over] twice, insert hook in same space, yarn over and pull up a loop, [yarn over and draw through 2 loops on hook] twice, yarn over and draw through all 4 loops on hook. fan = [ch 3, 3-tr Cl] 3 times in indicated space. hhdc (herringbone half double crochet) = Yarn over, insert hook in indicated stitch, yarn over, draw through stitch and first loop on hook (2 loops on hook), yarn over, draw through both loops on hook. reverse sc (reverse single crochet) = Work single crochet in opposite direction from which you would usually work (left to right if you are right-handed and right to left if you are left-handed). This stitch is also known as crab stitch. It creates a rope-like twisted single crochet edging. 3-tr Cl (3 treble crochet cluster) = [Yarn over] twice, insert hook in indicated stitch, yarn over and pull up a loop, [yarn over and draw through 2 loops on hook] twice; *[yarn over] twice, insert hook in same stitch, yarn over and pull up a loop, [yarn over and draw through 2 loops on hook] twice; repeat from * once, yarn over and draw through all 4 loops on hook. With larger hook, ch 164. Row 1 (right side): Hhdc in 3rd ch from hook (beginning ch count as first hhdc), *ch 1, skip next ch, hhdc in next ch; repeat from * across to last ch, hhdc in last ch, turn—83 hhdc and 80 ch-1 spaces. Rows 2–40: Ch 2 (counts as first hhdc here and throughout), hhdc in next st, *ch 1, skip next hhdc, hhdc in next ch-1 space; repeat from * across to beginning ch, hhdc in top of beginning ch, turn. Do not fasten off or turn at end of last row. Row 1: Ch 3 (counts as hhdc, ch 1 here and throughout), working across ends of rows, hhdc in next row, [ch 1, hhdc in next row] 3 times, *skip next row, [ch 1, hhdc in next row] 4 times; repeat from * across, turn—33 hhdc and 32 ch-1 spaces. Rows 2–20: Ch 2, hhdc in first ch-1 space, (ch 1, hhdc) in each ch-1 space across, turn. Row 1: Hold center panel with wrong side facing, join yarn with slip st in unworked end of first row, ch 3, working across ends of rows, hhdc in next row, [ch 1, hhdc in next row] 3 times, *skip next row, [ch 1, hhdc in next row] 4 times; repeat from * across, turn—33 hhdc and 32 ch-1 spaces. Rows 2–20: Repeat Rows 2–20 of first side panel. Do not fasten off. Change to smaller hook. Row 1 (right side): Ch 5 (counts as sc, ch 4 here and throughout), sc in first st, *ch 6, skip next 3 ch-1 spaces, (sc, ch 4, sc) in next ch-1 space*; repeat from * to * 7 times; working in ends of rows across bottom edge of 2nd side panel, [ch 10, skip next 5 rows, (sc, ch 4, sc) in next row] 3 times; working across center panel, ch 10, skip next 4 ch-1 spaces, (sc, ch 4, sc) in next ch-1 space, [ch 10, skip next 5 ch-1 spaces, (sc, ch 4, sc) in next ch-1 space] 13 times; working in ends of rows across first side panel, [ch 10, skip next 5 rows, (sc, ch 4, sc) in next row] 3 times; working across short edge of first side panel; repeat from * to * 8 times, turn—37 ch-4 spaces. Rows 2 and 3:Ch 1, slip st in first ch-4 space, (ch 5, sc) in same space, [ch 6, (sc, ch 4, sc) in next ch-4 space] 8 times, [ch 10, (sc, ch 4, sc) in next ch-4 space] 20 times, [ch 6, (sc, ch 4, sc) in next ch-4 space] 8 times, turn. Row 4: Ch 1, slip st in first ch-4 space, (ch 5, sc) in same space, [ch 6, (sc, ch 4, sc) in next ch-4 space] 7 times, [(sc, ch 4, sc)] 3 times in next ch-4 space, [ch 10, (sc, ch 4, sc) in next ch-4 space] 19 times, [(sc, ch 4, sc)] 3 times in next ch-4 space, [ch 6, (sc, ch 4, sc) in next ch-4 space] 8 times, turn—41 ch-4 spaces. Round 5: Sl st in first ch-4 space, (beg 3-tr Cl, [ch 3, 3-tr Cl] twice) in same space (counts as first fan), fan in next 7 ch-4 spaces, *ch 3, 3-tr Cl in next ch-4 space, fan in next ch-4 space, ch 3, 3-tr Cl in next ch-4 space*, fan in next 19 ch-4 spaces; repeat from * to * once, fan in last 7 ch-4 spaces, [slip st in vertical bar of last tr made] twice; working in ends of rows across first side panel, 2 sc in next 4 ch-4 spaces, 2 sc in next row, [skip next row, 2 sc in next row] 9 times; working in center panel, 2 sc in each ch-1 space across; working in ends of rows across 2nd side panel, 2 sc in first 2 rows, [skip next row, 2 sc in next row] 8 times, skip next row, 2 sc in last 4 ch-4 spaces, do not join or turn—37 fans, four 3-tr Cls, and 222 sc. Ch 1, reverse sc in first sc, *skip next sc, reverse sc in next sc; repeat from * across—111 sc. Fasten off. Would you wear this as a wrap or a scarf? Just starting to learn how to knit and I know how to purl and knit stitch but what is a wrong side purl stitch> I was wanting to do this one pattern I found and it says cast on wrong side purl stich and boy am I every confused.